OnePersonPlus® Defined Benefit and OwnersPlus Cash Balance Plans offer qualifying clients substantial annual tax savings over a short period of time in the years before retirement. A portfolio that minimizes volatility at this stage is often recommended. Large fluctuations in investment performance will result in correspondingly greater variability in annual contribution amounts. Each year, Dedicated Defined Benefit Services will calculate a contribution range for each plan. If the balances in a plan increase sharply as a result of investment performance in a given year, the required annual contribution range the next year might be lower. On the other hand, if the portfolio declines sharply, the required annual contribution will need to increase in the future for the plan to stay on track. The closer a client is to retiring, the more important it is to use investments that minimize the risk of a sharp decline in portfolio value. Clients are obligated to make annual contributions once their plans are established. Opening a plan involves a commitment to invest significant amounts each year for the life of the plan. Dedicated Defined Benefit Services is investment neutral so clients have complete flexibility to diversify across a selection of mutual funds, annuities, or equities with the objective of maximizing potential growth and minimizing portfolio volatility. We charge no asset-based fees on investments. 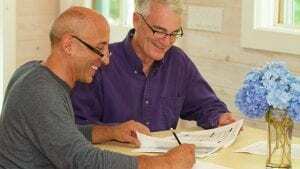 At retirement, or upon plan termination, IRS rules generally allow the owner to roll the assets into an IRA, where they continue to grow tax-deferred. Maintaining the assets in a tax-deferred IRA creates the potential for continued investment growth and opportunities for estate planning strategies to transfer wealth to younger generations.